The black Moleskine notebook is one of the most recognizable products in the stationary world, but the iconic pad is getting a brightly colored update for a good cause. The special edition #oneREDday collection is a partnership between Moleskine and (RED) to raise awareness and funds for the fight against AIDS. The collection includes a hard cover notebook, 2015 planner, red click pen, and luggage tag, all of which feature the iconic elastic Moleskine band in red. Five percent of every purchase goes to the Global Fund to Fight AIDS. 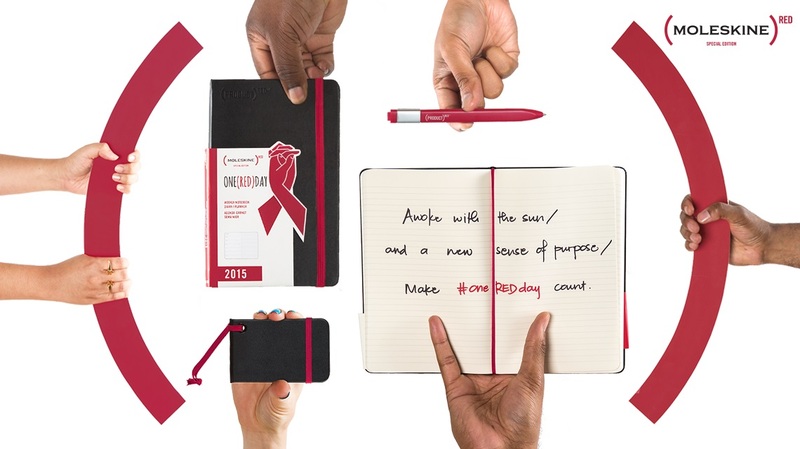 Additionally, the #oneREDday campaign asks people to use their notebooks to answer the question: If you had just one day to raise awareness around the fight against AIDS, what would you do and how would you do it? 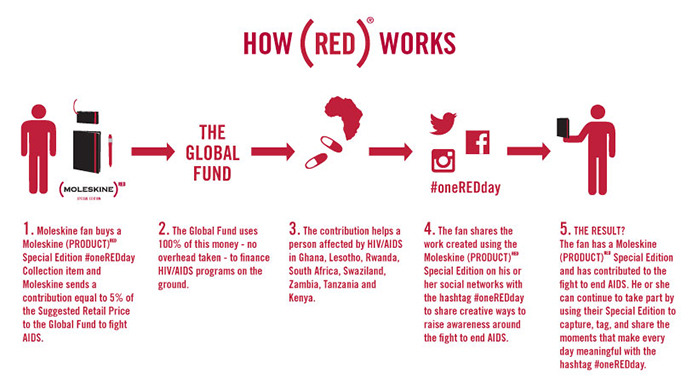 Selected illustrations and photos tagged with the #oneREDday hashtag are featured on the official campaign site. (RED), the AIDS charity founded by Bono and Bobby Shriver, partners with iconic brands who in turn donate up to 50% of sales from a special product to fight AIDS. To date, (RED) has donated $275 million to the Global Fund. The #oneREDday campaign is supported by “thinkers of all walks of life,” including OK Go’s Damian Kulash, Joy Wilson (Joy the Baker), and Dr. Robert Gallo (the researcher who discovered HIV). See the creative responses to the campaign here, and be sure to check out the new Moleskine collection, just in time for World AIDS Day on December 1.